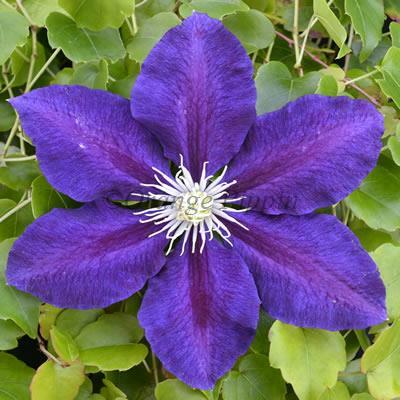 The rich blue-purple flowers of Clematis 'Vagabond' are velvety in appearance with a dark red stripe to each of the crinkly edge petals and lemon-yellow centres, making this a particularly eye catching variety. 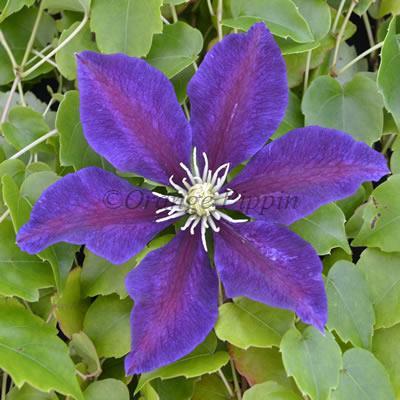 Clematis 'Vagabond' also known as 'The Vagabond' was raised by Ken Pyne of Chingford, London. It was introduced jointly in 1993 by Caddick's and Priorswood Nurseries. This non-evergreen climber can be grown up a trellis, pergola, along a wall, fence, up through a large shrub or tree or planted in a container on the patio supported with bamboo canes or an obelisk.